No doubt, that one of the main assistants in the kitchen is a digital kitchen scales. They will not allow spoiling the dish with an incorrect amount of components. Scales also help those who need to control their diet and food intake. 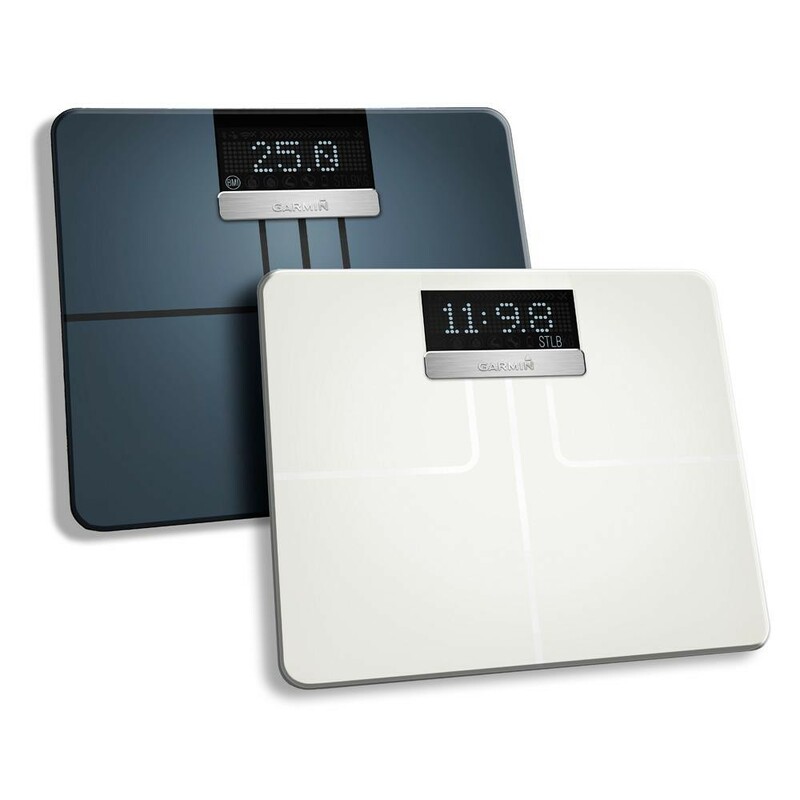 Here you will discover Ozeri ZK14-S Scale, Nutri Fit Scale, Mueller Digital Scale and many other models for you. The abundance of digital kitchen scales presented on the modern market, can in no way puzzle even the most sophisticated hostess, accustomed to various smart appliances. How to choose the right accurate and reliable digital kitchen scales? What are the key features for you? Let’s ensure that you find out a portion of useful scales information in our review. Certainly, your decision is connected with the scales usage targets. 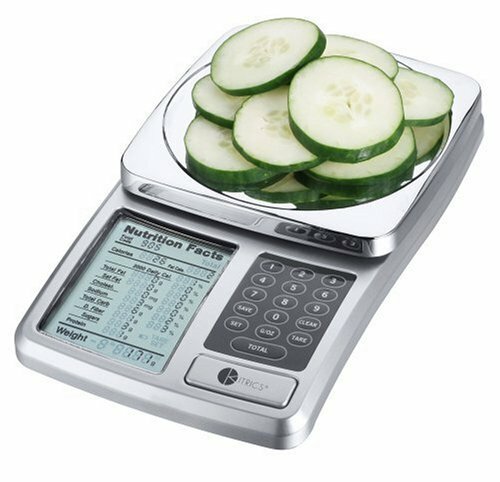 The simple digital kitchen scales with main functions will be suitable If you need to measure the ingredients or weight the items only. Focus on different criteria of the device to reach your aim in weight loss or diabetic treating. In this case, put the smart digital kitchen scale to the purchasing basket. 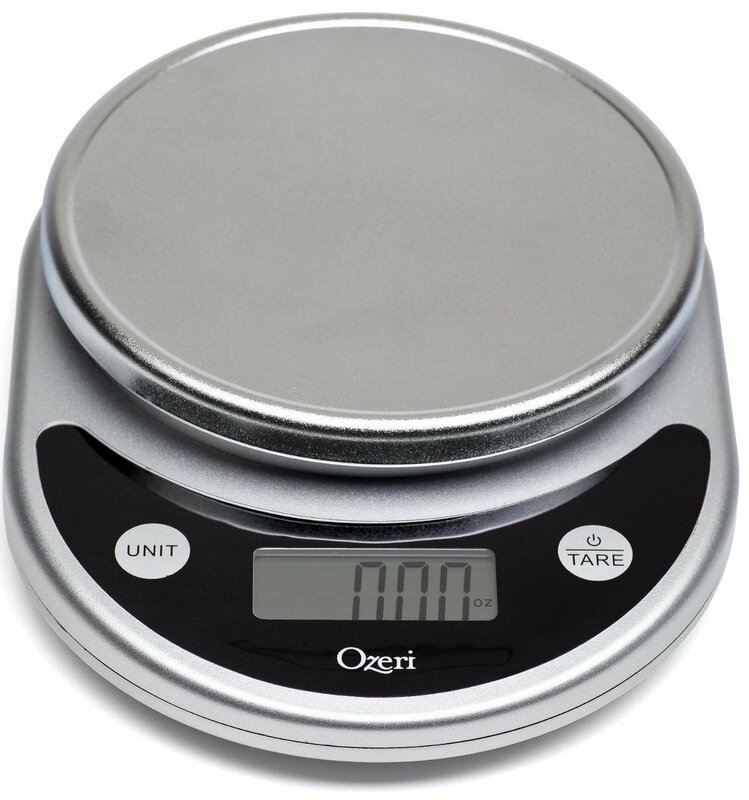 The leader among budget but reliable digital kitchen scales is Ozeri Pronto digital kitchen scale. This small but helpful home device will provide you comfort cooking and the way to keep correct diet ratio. Simple but stylish design available in a variety of colors attracts by its elegance. The light item is ergonomic for storing. Without no complicity, you are able to measure a variety of required things for diverse aims. It has a maximum possible weight up to11.24 pounds or 5100 grams. For sure, it’s easy to start the process. Just press the turn-on button and put the product on the platform. If you want to use the container or mixing bowl, first put it on the scale and then turn on. With the tare zero option, you do not need to do any calculations. It works with 5 measure units, for instance, grams, pounds, pounds and ounces, ounces and milliliters. LC display is easy to read, will show the symbols like g, lbs, lbs: oz, oz, ml. Due to the automatic button, you can choose the converted results. For example, 539 grams is 1.188 pounds and it is 1 pound 3 ounces, then accordingly 19.01 ounces is 539 ml. Battery: 2 AAA batteries required. Does the scale measure tenths of a gram? No. A tenth of a gram is not considered, only whole numbers in grams. The step of accuracy is 1gram. But, it shows ounces to hundreds like 0.01. So, it’s sensitive enough to weigh a plastic grocery bag. How to calibrate this scale? It can be calibrated to zero tares. The other possibility to check the accuracy is to measure the things with exactly known weight. Does this tool keep the last used figures? Great scale, yes, it certainly remembers them. Can the platform and the base part be separated for cleaning? Unfortunately, no. The scale is one piece item. However, it is organized for easy cleaning, just wipe it. It’s also possible to use the plate to weigh the food on it. Can we leave things on the weight for a long time? The manual advises avoiding leaving the things on the scale too long after weight them. The necessity and convenience of digital kitchen scale are clear. If you stand for healthy eating and prefer to know the exact weight of ingredients Nutri Fit Digital Kitchen Food Scale is your supporter. Rather budget device accurately measures and shows you the food weight in grams, kg, ounces or pounds. Thing, light and optimally sized scale will find its place in any convenient room for you. You like it for nice design and perfect multiple operations. 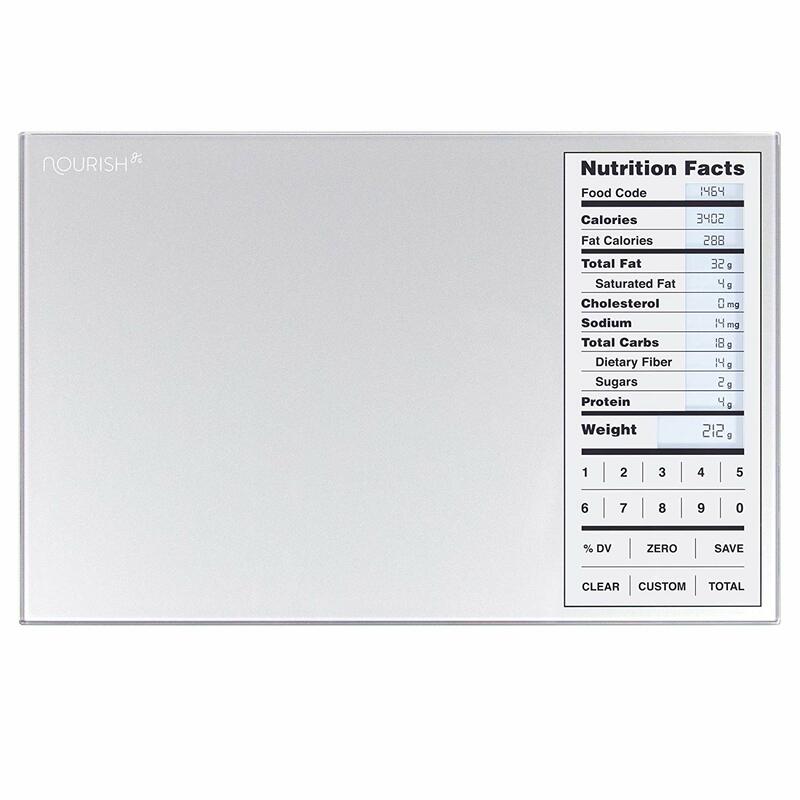 The Nutri Fit scale has a specific hygiene stainless steel surface protected from fingerprints. So, the tool is easy to keep clean. Its LCD screen is simple to read. Nutri Fit scale tare features to zero function and indicator of overloading and low power. Three minutes auto switch off saves the battery exploitation. Surely, Nutri fit scale helps you to control the calories and manage your cooking abilities. Can the scale weight milligrams? The screen shows the measures in pounds, ounces, grams, milliliters. What kind of material is the device made of? 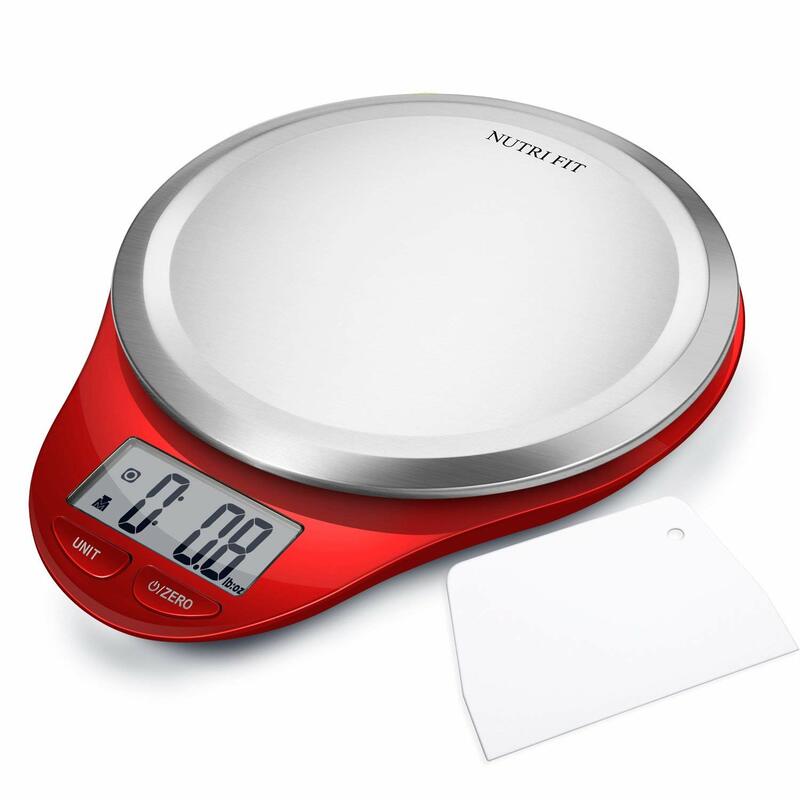 Nutri fit digital kitchen scale is manufactured of food quality stainless steel. It is fingerprints resistant. LC display is made of HD glass. How many and what batteries should I take? How to calibrate this scale in case of inaccuracy? In this case, you need to press and hold the power button for some seconds. Is it possible to operate the scale on the table pad or cloth? To obtain correct data, it’s necessary to put the scale on a hard, flat surface. Enrich your kitchen gear set by elegant but super accurate and convenient Meuller kitchen digital scale. Less than simple in operation the device will make your cooking projects much easier. Truly to say, you can weigh other required things in the range of minimum 3grams to 5ks. If you prefer the other measuring units, please, press the UNIT button to convert the results to ounces and pounds. The accuracy is 1 gram or 0,01 ounces. Safe, hygiene stainless steel top platform allows direct perfect scaling. It can be removed for washing. At the same time, you can use the plate, bowl or container to put there the food for weighting. The auto-function of tare to zero enables this option. Any extra calculations are not required. If you finish to weight or forget the scale is turned off automatically. It grants a longer life for 2 required batteries which are included in supply. The scale indicates low battery level and extra weight on the left upper and low corner of the screen. The dimensions are convenient to keep the tool in an appropriate place. The Mueller offers the items to make life better. So, the scale has display back-light for extra visibility. Weight indicator informs the rated capacity is left. Enjoy your cooking and diet routine with easy to set-up and use Mueller Digital Kitchen Scale. This little scale has helped a lot with Moms diet. She has to keep her carbs down and this little scale has 4 different weight measurement, the 2 used the most grams and ounces. Definitely, I like the fact that I can zero it out after each item I add, allowing me to use one plate and building upon it. A great example of this is building a chef salad, so instead of measuring everything in separate container/plate I would just put the salad on, get the weight zero it out then add tomatoes get the weight then zero it out, and so on. I like the little rubber feet on the bottom and how easy it is to clean off. This scale has got a ton of use, in our kitchen, since purchasing it last month, I honestly don’t know how we got along without it. This was a great buy. If you seriously keen on the diet to gain or lose weight, then you need a more advanced scale. This smart electronic food scale informs not only the weight of the desired ingredients but shows their macro and micronutrients. You can easily trace and control the quality, quantity, and calorie of the food for each meal time. Above all, the smart kitchen digital diet perfect portion scales allow evaluating the safety of a definite diet. So, you will notice a lack of nutrients. Their serious imbalance in the body can lead to serious health problems. Inexpensive food scale designed by nutritional experts. This kitchen devises weights in grams and ounces up to 11 pounds. Moreover, it also works as a nutritional calculator for about 1,000 healthy foods. The scale determines the calories, content of saturated and total fats, carbohydrates, proteins, fiber, cholesterol. Besides, it will show some vitamins and microelements like magnesium, sodium, calcium, potassium. Therefore, you can use it to define the portion volume. In addition, the tool is unchangeable for those who treat diabetes and control weight loss. Besides, the silver scale with glass platform will be a nice decoration of the kitchen interior. It is easy in operation. Memory mode saves and tracks 99 entries on a daily total or weekly base. 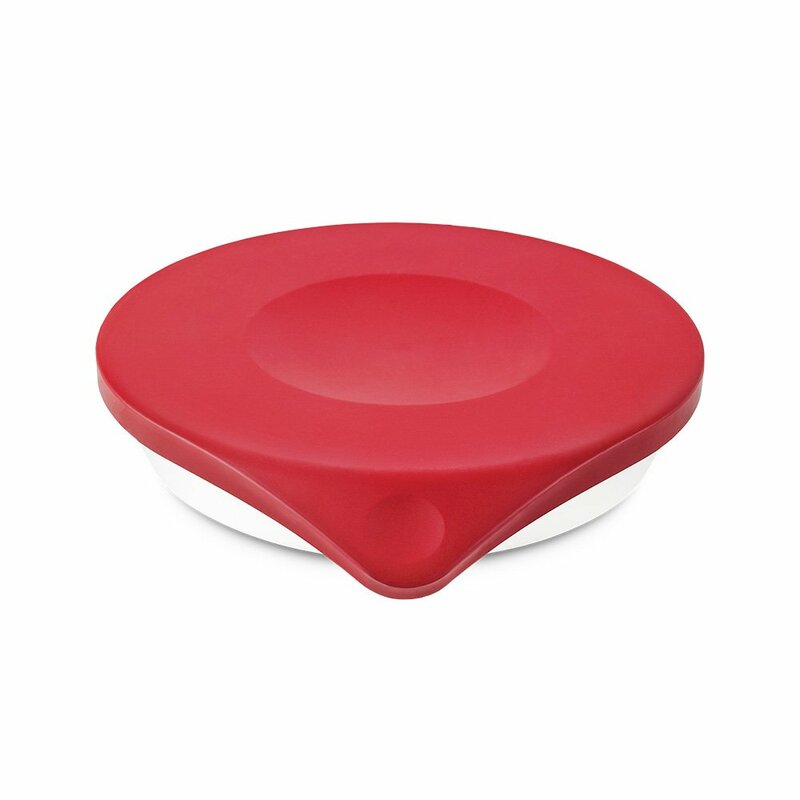 Tare button function allows using different dishes and containers for the products you are going to weight. The backlight is white provides better data reading. Produced by Health Tools LLC Mahwah, New Jersey. Made to our exact specifications in China. Battery: included 4 AAA batteries required. Does this scale calculate proteins in grams? Of course, yes. Select grams or ounces button. You can see 3 of 12 nutrients at one time. 4 screens will show the results. Just press the buttons 1 for calories, carbohydrates and fiber; 2 for sodium, potassium, magnesium; 3 for trans and saturated fat, cholesterol; 4 for calcium, protein, vitamin K.
Does this scale connect with any fitness phone app? Unfortunately, this tool doesn’t sin with electronic devices. Is the glass platform removable? Sure, you can easily remove the glass top. Just turn it slightly counterclockwise. A great assistant to keep the right portion volume. 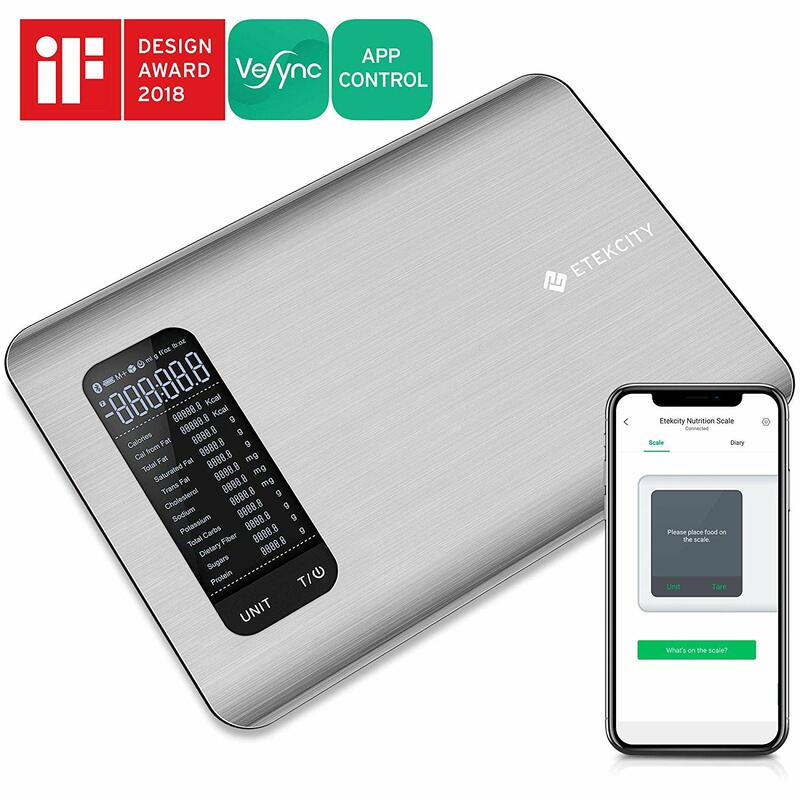 Etekcity Nutrition Food Scale, Smart Digital Kitchen Scale is created in the USA. First of all, it is a great food home scale. Without any problem, you can measure and weight small things, liquid and dry ingredients in grams, milliliters, pounds, and ounces. It’s no need to minus the weighing the tare separately. But its functions are wider. The device is able to illustrate daily food factors like proteins, fat, carbohydrates and macros. It calculates the calories too. This modernly designed home item has to skip resistance pad and rounded corners. The scale is portable, light and slim. For instance, the user can track up to 8000 useful products. Everybody can customize the data according to their aim. So, using this smart kitchen scale you control the amount and portion of the meal. It will become a great supporter of making diet menu and treat diabetic problems. For convenience, most functions are operated through the VeSync app directly on the personal phone screen. Acceptable with Bluetooth on Android and iOS. Memory mode saves and tracks 99 entries on a daily or weekly base. Tare function allows using different dishes and containers for the products you are going to weight. What is the minimum weight? They recommend 3 gram as minimum weight and 5000 gram as maximum. The increment is 0.1oz /1 g. You can measure the food in oz, lb: oz, g and in mL for the liquid ingredient. Is there a bowl made specific for this scale for fluids? You can take any suitable bowl for liquid or free-flowing products. Do not forget to use the tare mode to start with zero. Test your food evaluation and calorie control with Drop kitchen digital scale. This Drop device is a nice, accurate and useful home item. It works in connection with any model of iPad, iPod, or iPhone. 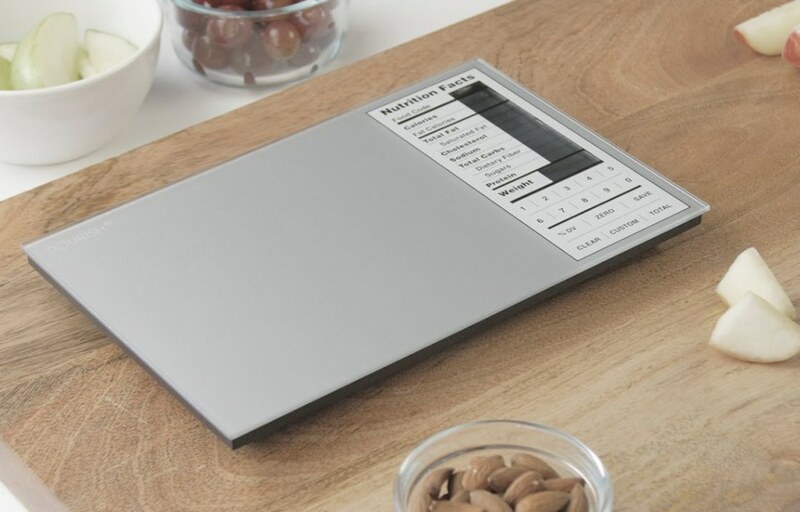 This smart scale accurately weighs the ingredients you need for a variety of recipes. You receive detailed education for food preparation of many healthy dishes. By the way, if you add more or less required ingredient quantity the scale inform about it. Moreover, the system may suggest to re-calculate the entire recipe. You can use it as a convenient kitchen scale to weight right portion of your every meal in grams and ounces. An important detail is that the application activates by direct contact of food or bowl with the scale’s surface. As a result, you do not need to touch the screen by fatty fingers. Idahoan smart kitchen scale is a reliable kitchen scale and nutrient calculator. It shows the results directly. There is no connection to the phone. You are free from app dependence. The multifunctional use is helpful in usual cooking and health treating. You will get accurate results in grams, ounces, and pounds metric systems. Without any problem the scale measure the liquids, for instance, water, juice, milk in milliliters. As it’s important to know what you eat, this weight devise helps to control calories, fats, proteins, carbs, fiber, cholesterol and other macros we need. So, just enter the food code and touch the sensitive button to obtain nutritional information. All the daily data are kept in memory. Accordingly, it allows following your daily meal and portion size per time. A nice designed kitchen scale is easy to clean and exploit. The list of 1000 foods like meats, cereals, veg, and fruits are in scale’s database. Additionally, the modes of cooking types provide accuracy in your receipts. All these facts assist the athletes, parents, and those who control the eating. This smart kitchen scale from Idaodan is equipped by the LCD display. The screen is built-up, lights-up and easy to read. Does this scale suitable for the home baking? Absolutely. This smart scale is great for all food cooking including baking. Can it weigh 1 gram? The minimum weight is 1 gram. It will be displayed 0 or 1 for something less. Does this tool need calibration? Special calibration is not required. Just to check the accuracy you can use any item with the known bag. For instance, 5 pounds bag of flour or sugar, etc. Does this home food scale have kg alternative? Do not worry. This electronic diet scale can promptly change the results in milliliters, grams, ounces, pounds, and ounces. Whole weight is 5 kg or 11 pounds. Does the top of the scale suitable for usual dishwashing? No, it doesn’t because the platform is fixed. So, it’s better to use food bowls or containers to measure the food amount. Just wipe the top when it’s required. ” The scale operates perfectly. We use the item for cooking & also for food portion request. Flexible, prompt and easy to manage it. This is smart, accurate and convenient to use. Especially like the functionality and price. Kitrics Digital Nutrition Scale helps you to manage your nutrition goals a lot. So, just enter the food code, then put the required ingredient on the top platform. Accordingly, you will see the product weight and the nutritional information of this portion. There is a list of 1999 general foods in the scale’s database. This list can e added by 99 personal favorite points. Consequently, this smart tool calculates calories we receive out of proteins, fats, carbs, fibers, track the sugar content, sodium etc. You can check the meal intake every day. In other words, you see what and how much you eat. It’s not possible to measure a huge quantity. But, the tool exactly scales in ounces or grams up to 72 ounces or 2 kg. Tare any container for more convenient and hygiene weight process. Kitrics digital nutrition scale is equipped by auto power-off function. It provides two AA batteries to work longer. Is it possible to buy the extra food code book that comes with this scale? Contact the supplier and they can email you a book copy. What material is the platform made of? Can we remove it for washing? The platform is made of food grade stainless steel. It’s not removable. However, you can easily wipe it clean. As an idea to keep the platform clean is to use a protective food plastic pad. The other way is to weight in a previously calibrated container. What does the UnSt error on the display mean? It means Unstable. It can happen when you move or shake the scale after turn it on. As I know, no chance. It shows in grams, kilograms, and ounces, pounds. Does it calculate potassium and phosphorus? Unfortunately, no these data. The device shows accumulated calories from fat, carbohydrates, protein, fat, saturated fat, fiber, sugars, cholesterol, and sodium. Proper diet is a significant part of a healthy life. So, to make the process of right cooking easier Greater Foods community designed Greater Goods Nourish Digital Kitchen Scale. The device is valid for a variety of aims. Accordingly, the scale accurately weights different ingredients and grams, ounces and pounds. Additionally, it traces and computes the whole daily food. The exact nutritional content guides you to complete the menu that moves you towards the target. Now it’s not a problem for you to get required fats, carbohydrates, proteins, and other macros. The scale assists to manage portions volume too. The scale keeps information about 2,000 foods. Besides, everyone can enter up to 99 extra personal nutritional items. It’s no need to calibrate or turn off all the time. A scale does it automatically. Firm glass top platform is durable and easy to clean. Thanks to zero tare function you can use a range of bowls or other containers to weight and analyze the food. Sensitive touch buttons are easy to clean. The feet are scratch protective and non-slip on the different surfaces. The switch to different weight measurement systems, for instance from gram to ounces. 4 accurate weighing sensors 3 AAA batteries (included). Where is there a food code application for android? The Greater Goods created Nourish Perfect Portions food code application. Find them for iOS and Android in Google Play or Apple AppStore. Just enter scale codes nourish. Can the scale calculate the ingredients like oils, flours, sugar to make the recipe? Sure, it can. It is also possible to add the required quantities and receive the whole weight at the end. How does it work for the product macros when it just on top? The special booklet with a long list of food codes is in their delivery pack. It’s necessary to enter the required code, the food and the nutrition facts will be illuminated on the screen. In case you fail to find the code in the book you can make your own 99 codes. Does the scale count fiber in fresh food? As a rule, you will get the fiber results by means of sub-tracking it from carbs. Is it safe from the water spills? Note, Not to put the kitchen scale into the water. Just wipe it clean. The glass surface predicts the spills to leak inside. You decided to concentrate on healthy eating. So, you need to define the correct portion and content of nutrients. In this case, Smart Chef Food Scale will help to reach the aim due to its multi-functionality. This is a smart device as it is integrated with free Chef application and Siri Accordingly, it’s possible to set the scale to zero position, change the unit and battery check the level of charge. The configuration with Android or Apple phone offers much great food advice including even tea and coffee brewing. Chef scale provides practically unlimited food data in a variety of languages. Additionally, the user is able to create their own nutrition profiles. 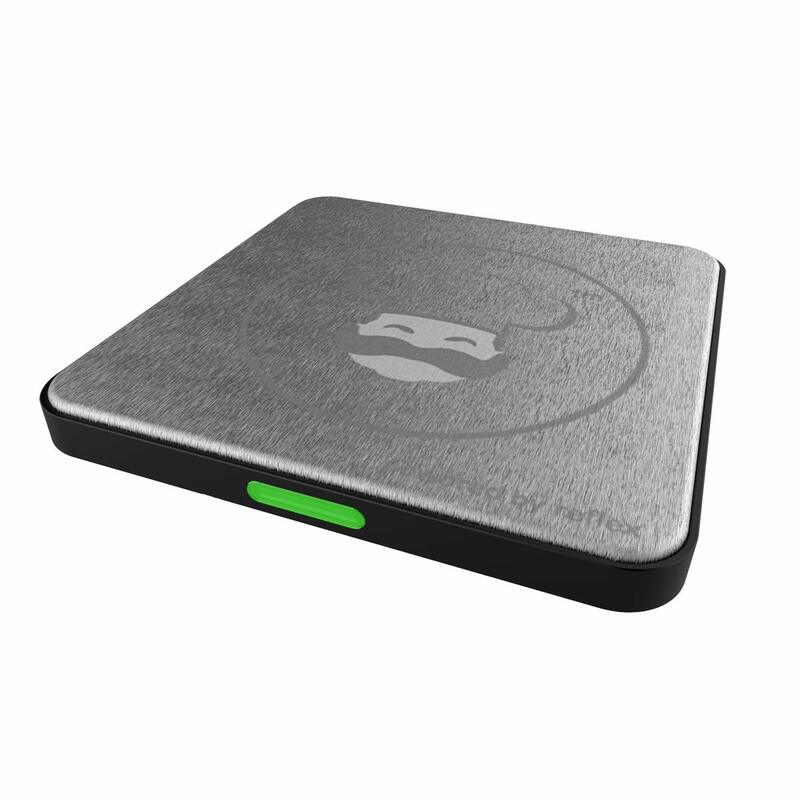 The scale is thin, super-portable, rechargeable and durable. A great kit to travel with. Does this track protein or only calories? Together with the calories, Smart Chef tracks protein, fat, carb and Micros like vitamins and sodium. Does it measure micronutrient for a keto diet? Yes, but you need to use the Super Tracker or Fitbit app for nutrition calculation. Does it only work with Android? Sure, it works with iPhone and Android OS. Find the “Smart Chef Scale” at Google Play to find the Android app. Does the app save the diet over time? Certainly yes. It keeps saved food ingredients and recipes of personal diet via the Smart Chef app and access to Apple Health, Fitbit, Smart Chef or Google Fit. The minimum weight is 3gram. New models have different lowest level. 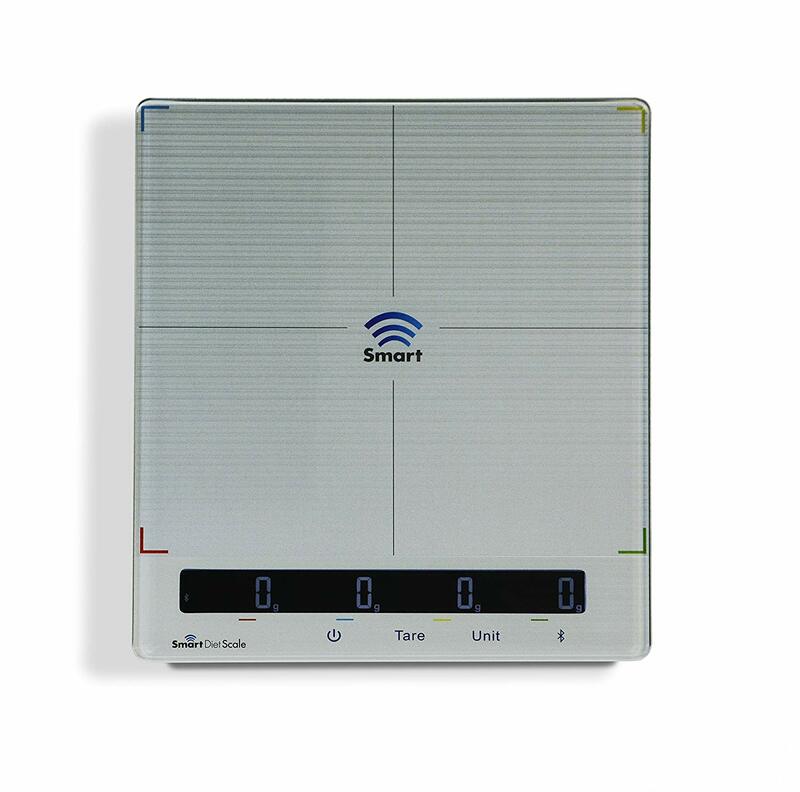 Marsden S-100 Smart Diet Scale is worthy smart kitchen device intended for meal weight and nutrient content measuring and managing. Coordinating this tool with your phone or tablet provides analyzing a wide range of food products and ingredients. It’s workable for both iPhone and Android systems. So, every day the scale helps to control the calories and nutrition value. In other words, this diet smart equipment boosts your weight loss targets and not only. This multifunctional, diet, perfect portion scale is unchangeable when you take care of your health. The Smart Diet Scale is able to weigh four food items at the same time. You can use either four special plates or take any suitable bowls. So, place the meal on it and enter the codes of ingredients. By means of application, it shows the macros and micros of each of the four products. Besides, it’s possible to scan the code as well to get the exact data. Personal recipes are saved and you can use it to make the cooking process easier. Durable tempered top surface allows easy cleaning. 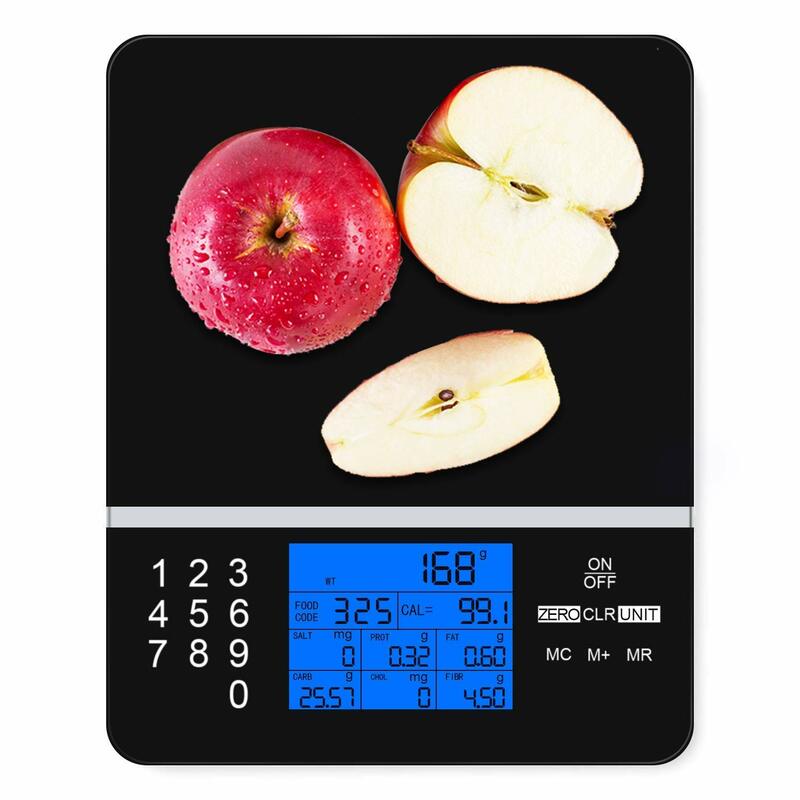 The users’ opinion is that this perfect portions digital nutrition food scale are perfect portions of smart technology. Is it difficult to manage the configuration of this personal food scale with an app? Certainly, you need some time to manage the application. The device is perfect. No issue, Bluetooth connection is a great decision. Bar code scanner operates fluently. It’s no problem to enter the food codes too. The store of nutritional facts is very impressive. It’s difficult to find the products beyond the list of database. Is it true that you can just tell what is on the scale to get the results? Yes, it’s true. In case the iPad or iPhone has any program of voice identification, for example, Siri. You can instruct and just name the foods. So, typing is not needed. First of all, let’s mention the two main positive qualities of these kitchen assistants. Namely. These are their high accuracy and calculation simplicity. So, you do not need to look for the calorie tables and do any math to cook healthy dishes. Develop the habit to weight what you eat and you will, definitely, see the benefits. Certainly, it’s possible to start with a simple digital kitchen scale. But in this case, you get only the quantitative idea of your meal. Indeed, it’s good beginning on the way to control the daily menu. The other level is a smart digital cooking scale with functions of perfect portions and nutrient calculator. Accordingly, you will know the quality of the products. They analyze the content of fats, proteins, carbs, fibers, salt, and even some vitamins. It’s, useful, easy, and cool, isn’t it? Besides, food kitchen scale organizes, disciplines, and helps to avoid many food excesses. Make the right decision and buy your personal nutritionist. 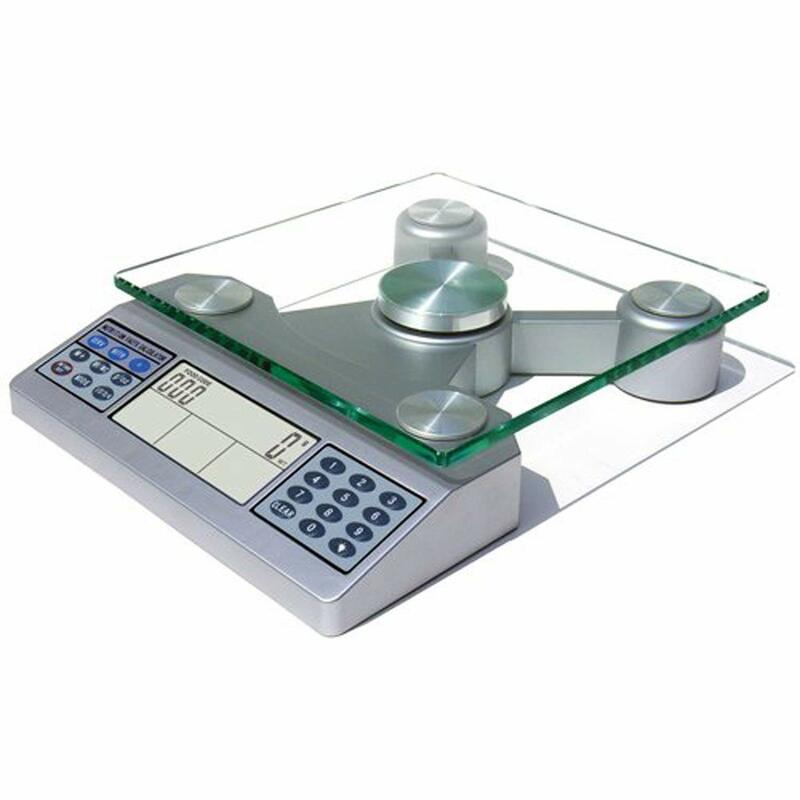 In conclusion, we believe that perfect portions digital scale review will help you to purchase the best from the best.